Personally, I’m quite tired of my cable bill creeping up a little bit here and there. I had this idea that I could arrange for cable television for a certain price and it would stay that price for some time – like maybe a year. But that’s not how it works. I call the cable company and agree on a package for a certain price and I get that package and that price for a few months. And then, with no warning, my bill one month is $0.37 more. And since I peaceably pay that bill for a few months, I am rewarded with another increase, this time maybe $0.81. At the end of the year, my cable bill is several dollars more than it was when I opened my account. I wouldn’t even get cable (I wouldn’t even have a TV in the house), if it weren’t for my husband who likes to watch programs that aren’t typically on rabbit-ear TV: Food Network, TLC, Discovery Channel, Animal Planet, the History Channel. Of course, he has very little time to watch TV, so I might try to convince him that we should go without for a few years. Maybe his next job won’t be so time consuming. Yeah, right. So the deal is that Viacom, which owns MTV and Nickelodeon, wants more money for their channels from Time Warner, which would mean one of those surreptitious hikes in Time Warner customers’ cable bills. And they are threatening to pull their channels if they don’t get it! “We make this request because Time Warner Cable has so greatly undervalued our channels for so long,” [Viacom] said. “Ultimately, however, if Nickelodeon, Comedy Central, MTV and the rest of our programming is discontinued — over less than a penny per day — we believe viewers will see this behavior by their cable company as outrageous,” it said. Certainly, I think the Peanut Gallery at most homes would be outraged: no Nickelodeon? Waaaa! But I’m wondering if there aren’t other bill payers, like me, who are just sick of the price increases. Be strong, Time Warner! Don’t let Viacom bully you! Because my girls’ ballet studio is a bit chilly, I gave them ballet sweaters and leg warmers for Christmas. They have worn them every single day, so I guess they like their gifts. 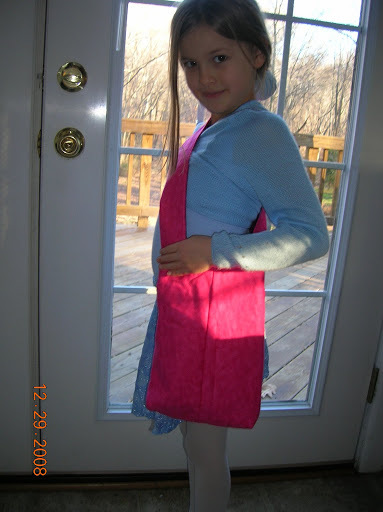 In Katie’s class, they wear light blue leotards, so she usurped the blue skirt I made Jenny for Halloween. This did not sit well with Jenny, who wanted a pink skirt to match her pink leotard. I bought the fabric weeks ago, and hoped to make it for the 25th, but I just didn’t have time. I also had some fabric I intended to use to make small bags specifically for the carrying of all this ballet “gear.” I’m a little tired of pink slippers on the floor of my van. This project, too, did not get underway before Christmas rolled around. But since I’m on vacation this week (ha! ), I have the leisure to partake in my favorite hobby: sewing. First, I modified the blue skirt from a wrap style to an elastic waist style. Then I made a pink one for Jenny, using the same wrap pattern (style H), but modifying it so it is slip on. 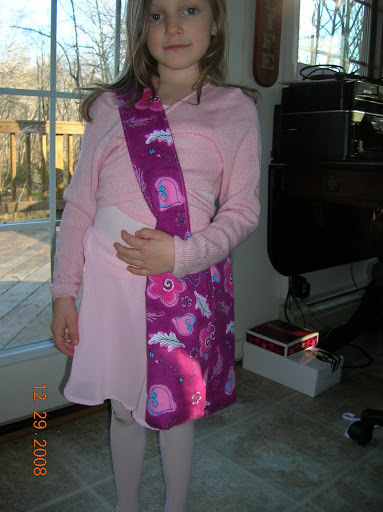 Then I modified this pattern to make shoulder bags for the girls. Mine are fully lined and narrower than the pattern designs. I also made the straps shorter for their smaller bodies. Fortunately, the girls preferred different fabrics, so they have opposite bags with the outside of one girl’s bag being the lining of the other girl’s bag. Now I’ll know who to yell at for leaving her stuff on the floor. It won’t be Jenny, though. She almost never stops carrying her bag. It is rather stylish. In this picture you can (barely) see a hair net I made for the girls back in October. I made another one for Jenny to match her bag. That was yesterday’s work. Today I’m replacing worn Velcro on two of my husband’s uniforms (a tedious job). I also hope to stitch on the proper patches to Billy’s scout uniform. It’s been 6 months, and he still has the council patch from his pack in Kansas. I think the kid deserves a squared away uniform, at least in time for the Blue and Gold Banquet in February. Bill put on his Christmas wish list a Remington 870. Fine. The man wants a gun for Christmas, I’ll get him a gun for Christmas. Oh, I’ll learn to operate it. That way, he can abandon me for weeks or months at a time but still rest easy at night, comforted by the notion that between the dog and the gun, his family can fend off the average bad guy until the police arrive. But as long as I have money and a grocery store that will take it, I will never ever shoot a duck or a pheasant or any other animal unless it is rabid and about to attack my toddler. Bill flew to Korea on November 30th, and first thing on December 1st, I called a friend of his. He helped me figure out exactly what to buy, where to go, questions to ask so that I would bring along all the proper paperwork. I’m not sure what all the other people in the office thought about Bill’s wife calling this guy as soon as Bill went out of town. But such are the indignities I am willing to suffer just to make my husband’s Christmas special. Finally, by the end of the week, I had the time to head down to the gun shop of choice. I packed all six kids in the car and put five bags of M&Ms in my pocket. The deal was, if anyone said that my kids were well behaved, the kids could have the candy on the way home. We had to be quite a sight. I, obviously, did not know a thing about guns. But the man was nice, the kids were complimented (and earned their candy), and I walked out of there a gun owner. This is something I never expected I would ever do. But that’s my husband: always getting me to try new things, stretch my horizons, grow, develop, expand. Or maybe that’s just part of being an Army wife. Because Bill then went to Japan and continued to be away for another week, I knew that the majority of the children would completely forget about our little adventure. Those who remembered were most likely to keep a secret. And they did, shockingly enough. In fact, I think even the older ones temporarily forgot, and didn’t say anything when Christmas Day arrived and there was no shotgun under the tree. It was the day after Christmas when Bill and his dad started talking about guns that Fritz, an eager listener, sought me out. “Uh, Mom, what about Dad’s gun?” he asked. “Don’t worry about it,” I reassured him. And, good kid that he is, he left it at that. I couldn’t resist. Instead of giving it to him for Christmas, I saved his “family gift” for yesterday, the Feast of the Holy Family. I’m not sure what Jesus, Mary and Joseph would think about my gift, but I think it’s funny. Bill was thoroughly surprised, and I’m not sure which impresses him more: me buying a gun or the kids keeping a secret. And although I find myself to be completely predictable, I am still managing, after nineteen years, to keep Bill guessing. Overheard 50 times per kid times four kids. Let’s add sugar into the mix. Just for fun! For school, Fritz just needs to recopy an essay and read a few chapters in a book and then school is officially out for 2008. I guess I’ll be heading to another grocery store when he’s done. Today is baking day. Tomorrow is cleaning day. Bill has a theory that Christmas lights charge up children. Last weekend he decorated outside, and the kids went wild. Yesterday he strung the lights on the tree, and I was convinced I could hear their little bodies emitting a humming vibratory noise whenever they passed near. Only.three.more.days. Are you excited yet? This is cute. H/T Katharine at No Fighting, No Biting!